I was actually nervous taking red paint to this white lampshade! Wouldn’t you be too? But I followed the advice of stenciling pros and it turned out great. 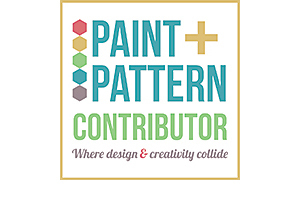 Hop on over to my post at Paint + Pattern to see how to do it! 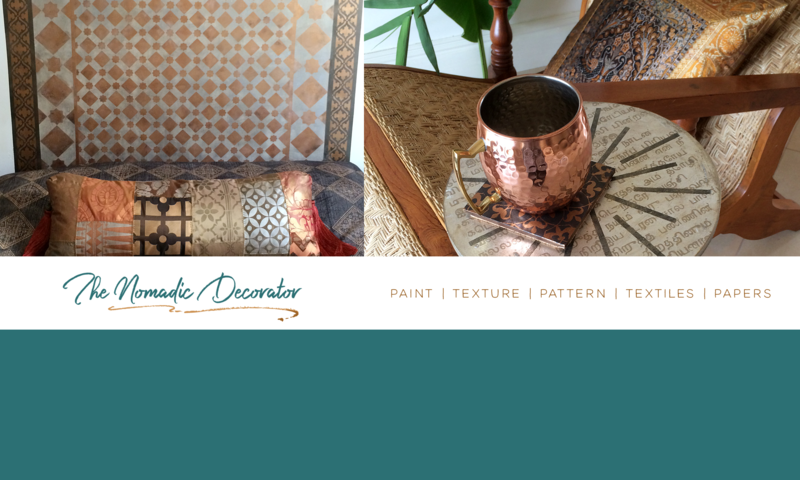 There you will see the step-by-step photos for stenciling this lamp, and you’ll get tips for how to get a clean crisp pattern when painting on a lampshade. That’s a lamp kit made by Westinghouse and it’s available at Home Depot. So you can go to your local home improvement store, go to the lighting section, and there will likely be several “make-a-lamp” kits there, although style and size choices might be limited. You can also order lamp kits online. There’s a website called lampstuff.com and it’s not a beautiful site but they know their lamp stuff, and they have a large number of lamp kit choices for any kind of lamp you want to make. Your harp should be close to the height of your lamp shade. Most home improvement stores and online lamp part shops sell harps in a variety of heights. I now have harps in three sizes due to the misadventures during this project! 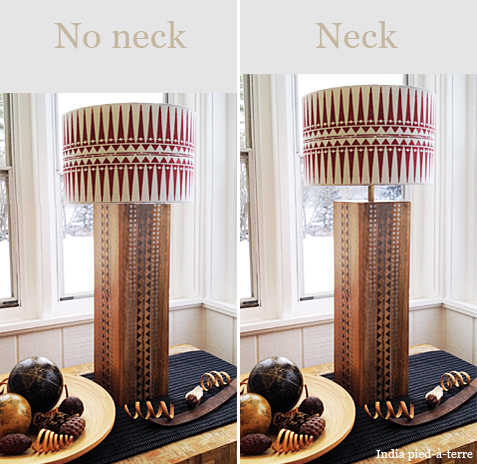 In addition, you might want a “lamp neck” so that your lamp shade isn’t sitting right on top of the lamp base, like a head sitting on shoulders with no neck. 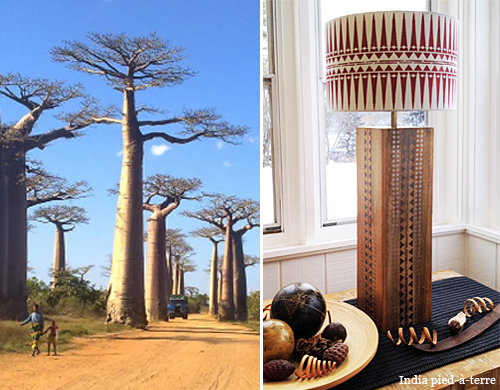 While these lamps look great, I thought my lamp shade and base looked unnaturally “squashed together” without a neck. So I ordered what I thought were necks in a few sizes to try. But do you see the problem here, in those two extra pieces sitting there? How do you thread the electrical cord through those? You can’t! Turns out I ordered the wrong thing. These are not necks to put just above the lamp base to boost the shade up. 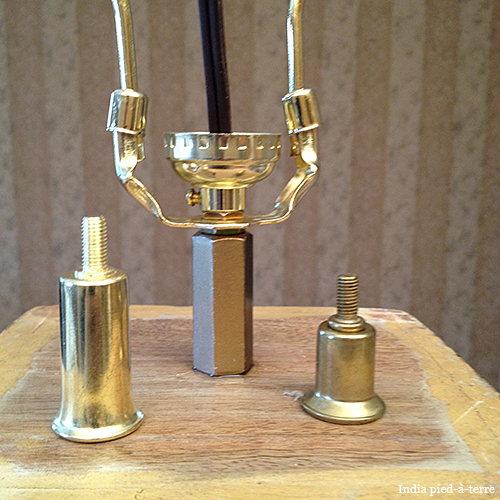 Instead, these are called risers, and you add them to the top of the harp, above the lightbulb, to boost the shade up. 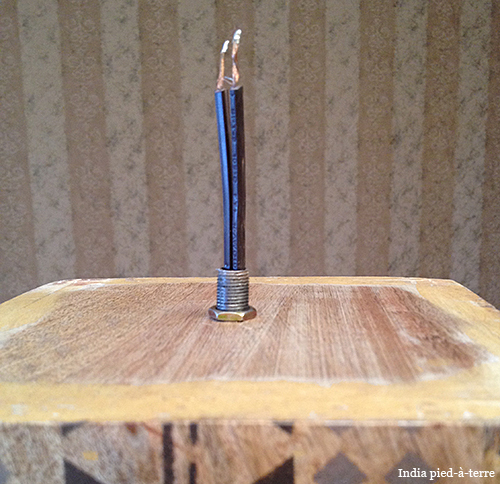 I feel like I probably talked too long here about such a little piece of a lamp! But I believe details are important. 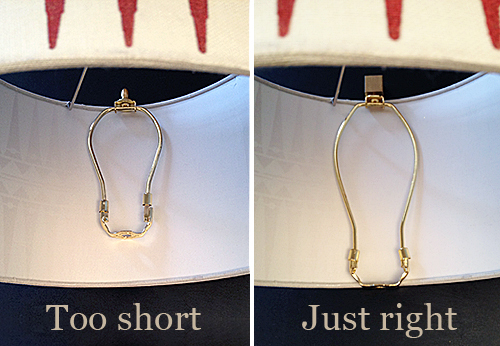 Think of the neck as the earrings or the bracelet of a lamp. It’s a small accessory but can make a difference. 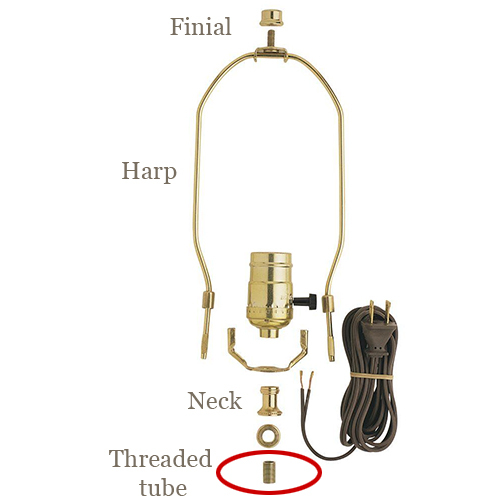 If you want to go on an adventure seeking just the right neck for a lamp, there’s a bunch of simple and fancy ones here at lampstuff.com, and here at Grand Brass Lamp Parts. When I realized my neck was all wrong, I went to Home Depot searching for “something metal and tube-shaped.” You know how the friendly Home Depot staff say “hi” and ask if you need help? I declined. How do you even explain this. Sometimes people think too literally and I was ready to break all rules and see the possibilities in anything in any aisle. I found a bolt thing with a big enough hole to thread the electrical cord through it. I spray painted it gold. And I called it a neck! 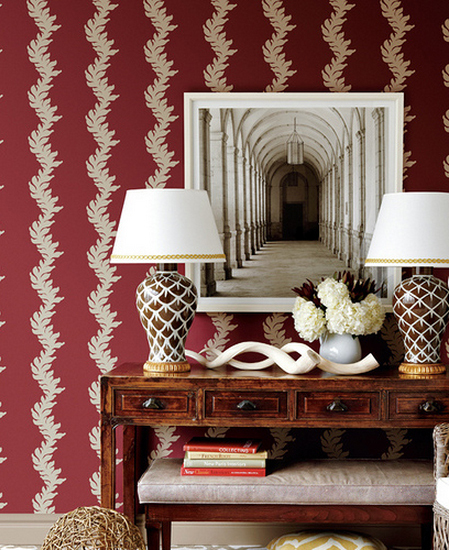 The other visible fashion choice is the finial above the lamp shade. There’s an endless number of choices for finials. There’s entire websites full of finials! 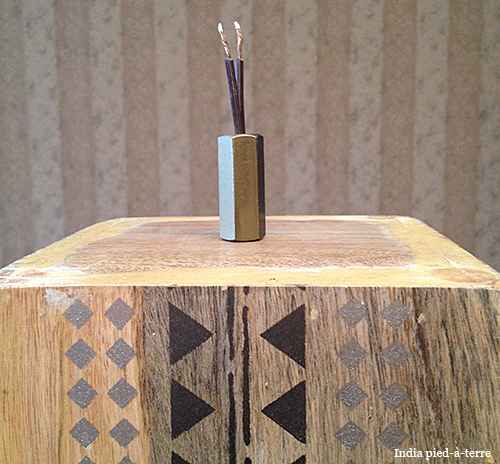 I found a chunky square brass finial at Grand Brass that complements the chunkiness of my lamp. But the hole of this finial is too big for the lamp shade harp. I can’t screw the finial on! Another lesson – not everything ordered online is compatible, even when it’s just a finial for a lamp! So I don’t know. This is the finial for this lamp. Maybe I’ll glue it on. For now it’s doing a delicate balancing act above the lamp. After all this, the rest of this lamp-making project was easy. 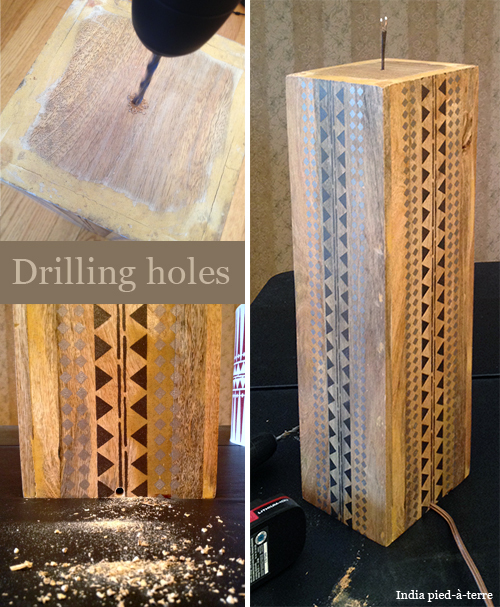 When you have all your lamp pieces ready, it’s time to drill some holes. I measured the center of my wood piece and drilled a hole. You will also likely need to drill a hole at the bottom of your base to clear room for the cord, because I bet you’d like for your lamp to sit level and not tilted! Fit all the pieces together. 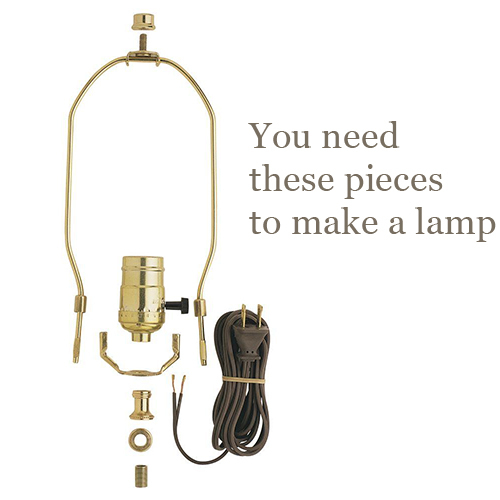 Your lamp kit might come with directions. If not, it’s pretty self-explanatory. The lamp kit photo above shows the order of how things fit together. 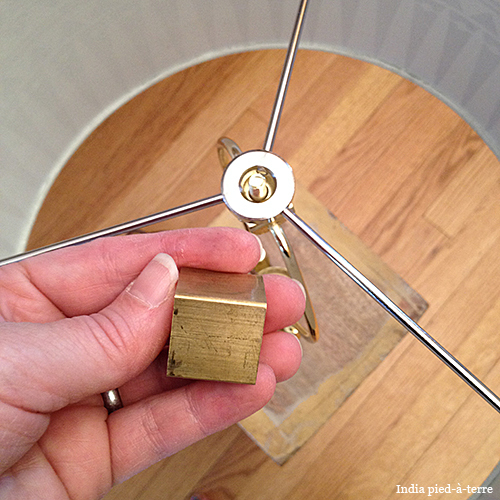 Some lamp kits come with the electrical cord pre-installed in the lamp socket. With some kits, like the one I used, you have to insert the electrical cord into the socket yourself. I’m going to stop here and not get into advising how to install the electrical cord in the socket. I’m not an electrician and not qualified to give that advice. I’ve worked in a hospital burn unit during my career and seen the injury and devastation of fire. So my best advice is, get advice from the professionals on anything involving electricity. Here’s a video from the FIX IT Home Improvement Channel that shows detailed step-by-step of how to install electrical cord in a lightbulb socket. Clearly my adventure here was more about the design decisions – including some misadventures! If there’s a lamp-making class somewhere like SkillShare, I’ll be all over that registration form! Because there’s extra parts to use up around here. Anyone want a harp riser? P.S. – Don’t forget to visit the fun painting and stenciling part of this lamp project at Paint + Pattern! 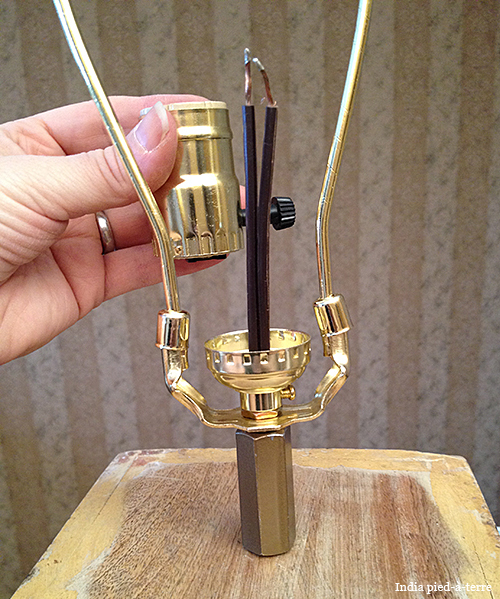 Well Deb, you’v either inspired me to make a lamp out of something….anything….or to never, ever try this!! Just kidding :) Great amount of detail in this project and so nice to know about all the resources out there! I totally know what you mean!! I think it wound up like this because I get so picky about the details … doesn’t have to be that way though, the basic kits really do have everything needed to make a lamp! 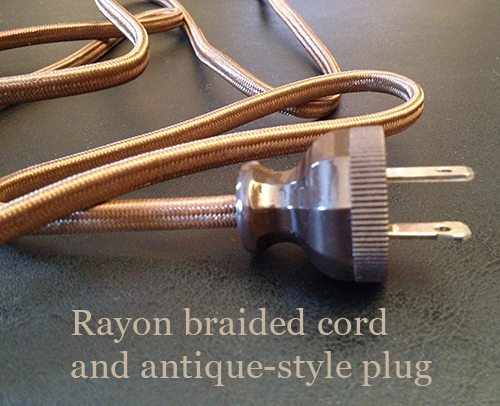 I did not know you get the antique looking cords and plugs. Love the tutorial. How did you drill for two feet straight? This is the COOLEST lamp ever! Thank you Heather! 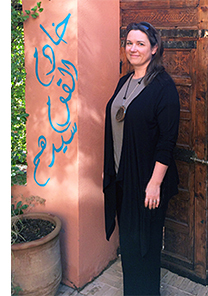 I clicked around and found your etsy shop – you make beautiful jewelry! Why thank you! You’re such a sweetheart! Nice tutorial! I think you’re right about the little features making a big difference to the overall look of the lamp. The basic kits work for 90% of the population but sometimes you need something to make it stand out. 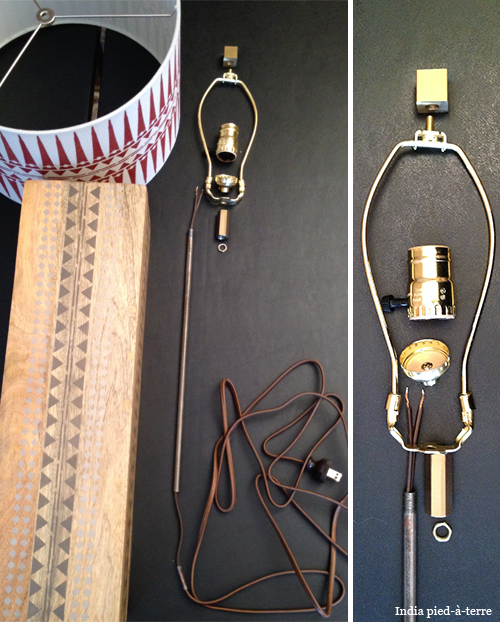 I sell lamp & lampshade kits on my site and am hoping to also help ‘demystify’ the process of making DIY lamps. Your pointers are excellent! I’m going to share this post with my facebook followers. Wow this lamp really caught my eye, Nice Job Deb! Great tips too, pinning, stumbling, sharing, love the tutorial! Next PostNext This Week: Featured in Online Magazines!